Many readers enjoy seeing the story behind the story, and bits and pieces of what go into growing a story. If that's you, I hope you'll enjoy this post. My Emerald Isle, NC Stories series began with my debut novel, BEACH RENTAL, released in 2011 ~ sweet romance & sweet inspiration ~ and featured Juli, Ben, Luke and Maia. BEACH WINDS followed in 2013 and was Frannie and Brian's story, with Juli, Luke and Maia as part of their lives. Now, the third novel, BEACH WEDDING, will be released on November 14. It's Maia's story. It unites all of the stories as only Maia can. My family spent a week in Emerald Isle, NC back in 2007. At that time, I didn't know Juli's story was waiting to be born, but later, when the story came to me, I knew the perfect place to set it ~ the rental duplex where we'd stayed. 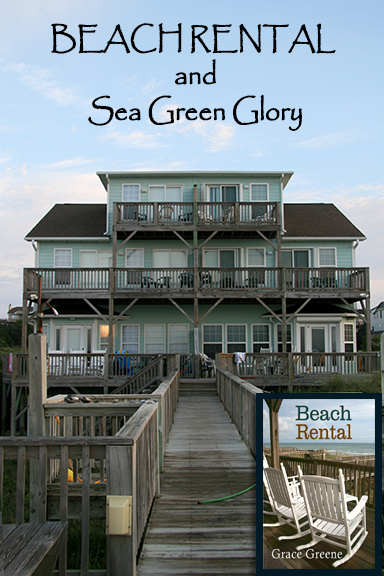 It was named Sea Trace West at the time of our stay, but I renamed it Sea Green Glory for BEACH RENTAL. 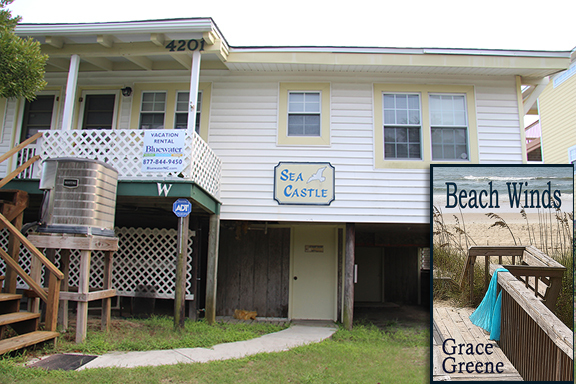 A few years later, shortly after BEACH RENTAL released, a reader contacted me to tell me she had added the book to the library she kept for readers in her father's beach house, a duplex rental, in Emerald Isle. He was a veteran, and his story touched me because my great-uncle, also a WWII veteran, had suffered a stroke and he fought to recover, but ultimately lost. If you've read BEACH WINDS, you'll see that connection as part of the story and you'll see Frannie, herself, do battle herself to discover the truth about her history and her life. The original Captain's Walk (actually named Sea Castle) is shown here. For the purposes of the story, I changed it from a duplex to a single dwelling and added a roof-level deck. I've never actually been inside so my physical descriptions of the house are totally fictional, and this view is of the back (street-side). But every time I think of it, I think of the owner, his daughter, BEACH RENTAL in the library closet, and my own great-uncle. In 2015 when I attended my niece's beach wedding, I had already begun working on BEACH WEDDING, but I didn't understand the full story yet. And before it was finished, I agreed to write THE HAPPINESS IN BETWEEN and THE MEMORY OF BUTTERFLIES for Lake Union Publishing. BEACH WEDDING went onto that back burner we're all familiar with. By the time, I returned to it, this year, to finish the story, the story had changed. I won't give away any plot spoilers, but BEACH WEDDING, as Maia's story, may not be what you're expecting...but then, that's Maia. She is a strong-minded woman and has her own way of doing things. BEACH WEDDING crosses from Emerald Isle, to Morehead City, to Beaufort, and even travels up to Merrimon, NC, but most of the story plays out in Beaufort where Maia's heart is. Here's a picture of her bench with its view of the marina, the one she goes to for lunch or phone conversations, or even to meet friends, and Joel. I HIGHLY RECOMMEND THAT YOU READ THE THREE NOVELS IN ORDER FOR BEST ENJOYMENT: BEACH RENTAL, BEACH WINDS, BEACH WEDDING. If you're interested in a recommended reading order for all of the Emerald Isle, NC books, here it is: BEACH RENTAL (novel), BEACH TOWEL (short story), BEACH WINDS (novel), BEACH WALK (novella), BEACH WEDDING (novel). 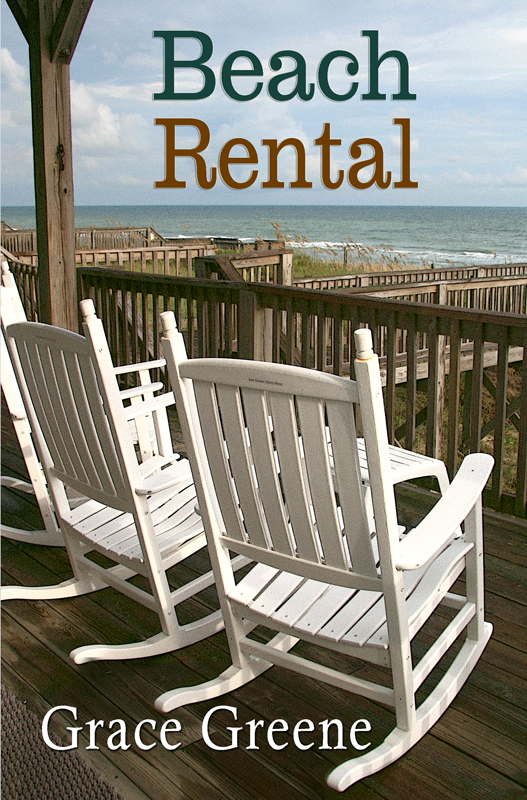 **SALE**BEACH RENTAL will be on sale for 99 cents 10/20 through 10/22 so if you haven't already read BEACH RENTAL, here's a great opportunity for a deal. You'll find it HERE. **NEW RELEASE**BEACH WEDDING book release on 11/14**PreOrder HERE. Along the Outer Banks of North Carolina and the Crystal Coast ~ from the Front Street Gallery in Beaufort, NC, to the beaches of Emerald Isle and across the sound to Morehead City ~ Maia Donovan has watched her friends find true love, and has dreamed of her own happily-ever-after, but wishes and reality don’t always match up. When Maia met Joel Sandeford, she thought she’d found a man worth risking another broken heart over. But she’s hesitant. Joel lives out of town and always seems to be working. Maia, too, works long hours and spends most of her time managing the Front Street Gallery. She fears the distance and their work ethics may spell disaster. But Maia doesn’t realize the biggest impediment to her happily-ever-after may be herself, and the memories she’s hiding in her heart—that part of her heart that still belongs to her first true love. Grace Greene is an award-winning and USA Today bestselling author of women’s fiction and contemporary romance set in her native Virginia (Kincaid’s Hope, Cub Creek, The Happiness In Between, The Memory of Butterflies) and the breezy beaches of Emerald Isle, North Carolina (Beach Rental, Beach Winds, Beach Wedding, Beach Walk, Beach Towel, Beach Christmas). Her debut novel, Beach Rental, and the sequel, Beach Winds, are both Top Picks by RT Book Reviews magazine. For more about the author and her books, visit www.gracegreene.com or connect with her on Twitter @Grace_Greene and on Facebook at www.facebook.com/GraceGreeneBooks. Thanks for all the info, Grace. I am very familiar with the areas you mention, as I live near Charlotte, NC. Best wishes on your latest release. And, your book covers are gorgeous! Thanks, Josie! It is a beautiful area!